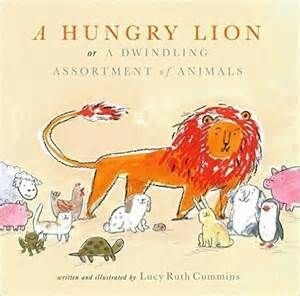 A Hungry Lion, or a Dwindling Assortment of Animals by Lucy Ruth Cummins is a book that I have been wanting to devour for months and months. It’ll be released into the wild from Atheneum/Simon & Schuster on March 15, and Lucy is HERE to share some behind-the-scenes information. 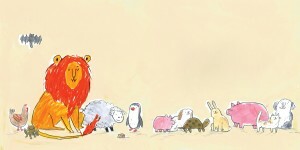 The very hungry lion is all set to enjoy an exciting day with his other animal pals. But all of a sudden his friends start disappearing at an alarming rate! Is someone stealing the hungry lion’s friends, or is the culprit a little…closer to home? Personally, I give this book five gold stars, two thumbs up, and a standing ovation. 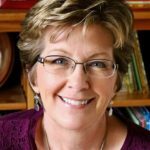 Welcome to Picture Book Builders, Lucy! I have to know…what sparked the wonderful idea for this book? One day the thought crossed my mind that if you had a group of animals, and with a page turn, there were animals who seemed to disappear, that with just that much you’d have a mystery on your hands! I did some thumbnails of this concept and I was sharing them with my writer friend Alexandra Penfold and I mentioned to her that I needed to think of an author and illustrator who could tackle the idea. Without missing a beat, she suggested that I take a crack at it myself, which hadn’t even occurred to me! As an art director, I’m so used to matching projects to talented people and to smoothing and polishing the stories of other folks that it didn’t instinctively occur to me that what I had was a solid story idea I could explore on my own. Your animals are so fresh, fun, and just-plain-adorable. Some might even call them yummy. Did the cast members start out looking this way or did they evolve over time? There was a bit of a casting call process for who made it into the pages, actually. I started by filling a page with individual animal doodles as they came to me, species by species stream of consciousness style. Then I whittled them down bit by bit to a core group who met two criteria: very cute, and very edible. Honestly! Among the rejects was a very adorable porcupine who I didn’t think would . . . go down quite so easily. Did you face any particular challenges while writing and/or illustrating A Hungry Lion? One of the challenges I had was that I did the initial roughs for the story straight through, working from beginning to end, thinking “these are roughs, and they will evolve” but when it came time to add polish, there were a few spreads where the very first attempt I made had the most energy, and captured the emotion and expression I wanted more perfectly than later versions. I was honestly a little nervous to say to my art director Sonia Chaghatzbanian that I wanted to keep some elements of the dummy. She was very supportive, though, and agreed with my preferences. I don’t know why I was terrified to ask! I think I was worried I wasn’t working hard enough if some things came straight out of the pencil in a way that worked for the storytelling. In terms of writing the story, my editor Justin Chanda asked during the acquisition process if I thought there was anyway to add one last beat to sweeten the pot a little bit. Initially I balked—I didn’t want to defang my lion! But in the end I think that prompt led to a VERY satisfying final spread that I wouldn’t have gotten to otherwise. 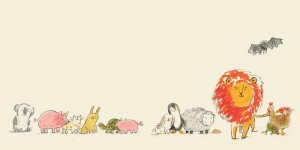 a woolly sheep, a koala, and also a hen. Please give us a tour of your studio. My studio is really just an art cart with all my supplies, wheeled up to my dining room table when I need to work. And if I have a lot of work to do, I tilt that table so it has a view to the television set (because I very much enjoy doodling and watching at once). I do a lot of drawing while I sit on the couch, too, just with a lap desk, when I’m just doodling. My primary writing studio is the L train and then the F train, every morning and every evening on the way to and from work. I work on my stories on my iPhone in the Pages app, as often as I can, in bursts while on the train. I also keep little lists of idea stubs in my phone’s notepad. I had my son Nathaniel in August of 2015, and as a new mom, and newly back at work, my creative time often has to be carved out wherever it can be found these days! If you had one key piece of advice for writers and/or illustrators, what would it be? 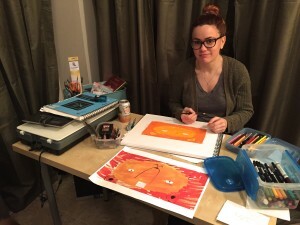 As an art director, one of my favorite things to do is look through the portfolios of illustrators, and identify a piece within their body of work that looks like it is situated in the center of an existing story, and ask them to brainstorm back a few steps and forward a few steps to create a story around the piece. Ooh. That’s a great exercise! Scoop time! What’s next for you? I am currently polishing up a dummy for a new picture book and hoping to start sharing it soon, and I have two other stories still in draft stages that I’m excited to keep honing. In the meantime, I’m getting super excited for the launch of A Hungry Lion, which is March 16, and the launch party that will be at Books of Wonder in New York on March 19. I finally found a dress! And the cupcakes will be spectacular. Thanks for visiting Picture Book Builders, Lucy! 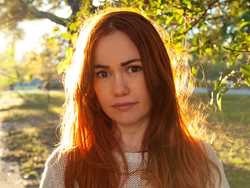 Lucy Ruth Cummins is a writer and an illustrator and also a full time art director of children’s books. She loves watching television, reading really long books about US Presidents, and Pomeranian dogs. She was born in Canada, raised in upstate New York, and currently resides in Brooklyn, New York. Her favorite food is the french fry. Bonus Fact: Lucy is also the mastermind designer behind ME WANT PET!, my book with Bob Shea. Lucy is giving away a signed copy of her fun and fierce book. Leave a comment for your chance to win. I’ll notify the winner on April 1, no foolin’. Tammi Sauer is a former teacher and library media specialist. She has sold 29 picture books to major publishing houses. In addition to winning awards, her books have gone on to do great things. Mostly Monsterly was selected for the 2012 Cheerios Spoonfuls of Stories program. Me Want Pet! was recently released in French which makes her feel extra fancy. And Nugget and Fang, along with Tammi herself, appeared on the Spring 2015 Scholastic Book Fair DVD which was seen by millions kids across the nation. Her latest books include I LOVE CAKE! and Ginny Louise and the School Field Day. Bob Shea, Lucy Ruth Cummins, Tammi Sauer. Bookmark. Making Yaks Yak with Linda Sue Park, A Book Giveaway and a Birthday! Celebrate: Gorgeous Picture Book Covers! I can’t wait to read your book, Lucy! And I loved seeing your time lapse! Congrats on your debut! Thanks for stopping by PBB! This looks absolutely DELICIOUS! Congratulations, Lucy, and thank you, Tammi, for spreading the word about it! Sounds like a great book! And I’m going to try that writing exercise. I’m going to give that exercise I try, too. Thanks for sharing this post and how the idea came to and the development of it. Very helpful. Okay, I HAVE to go get this, pronto. Definitely going on my must read list! I love the writing exercise as well. Kids will love this. When I read this post I thought of how much kids love “There Was an Old Woman Who Swallowed a Fly.” This one leaves us guessing who did the action which makes it even more fun. I am curious about that and the setting. Where would all these animals be gathered together? Looking forward to reading and rereading this one. Thanks for this write up and for the chance at a copy of the book. You are the winner of A HUNGRY LION! Please send your snail mail address to me at tksauer at aol dot com, and I will pass it along to Lucy. Congratulations! P.S. Be very careful when reading that book. The lion is hungry, you know. I got your Facebook message and sent you my mailing address. Thank you! Very nice job on the interview.Great questions. Loss of information. Can’t wait to read it! I love the colorful characters and their loose, expressive lines. I’m so hungry for this PB my mouth is watering. Yum. Yum, YUM! I am very hungry to read this book. Yum. I have a very similar “studio”. Wishing you success–can’t wait to see the book! This book looks sooo tasty. I can’t wait to read it! Congratulations, Lucy! Can’t wait to read it! Congrats! You are in for a delicious treat! I enjoyed this interview so much. I especially love the tips for writers/illustrators. I’m going to try them out. Looking forward to reading your book. Congratulations! Wonderful! Can’t wait to take a look at this book. Also inspiring how you work on the train- we all can find time for creativity if we try! Can’t wait for this roaring new book. I hope they disappear off the shelves quickly. It’s a jungle out there!!!! Looks great. I can’t wait to see it. Congratulations! Thanks for sharing the story behind how the book came to be! I’m really excited to read it now! It is and it is! You’re welcome and you’re welcome! I would love to DEVOUR this book page by page! The bunny with un-floppy ears would be the yummiest I think. I can’t wait to read it. Thanks for giving us a glimpse into the mind of of a person who wears so many hats! I can’t wait to read this book! And the time-lapse was wonderful! Thanks for stopping by PBB, Gaye! Great interview, Tammi! I’m already seeing hilarious page turns. Can’t wait to read it!! Love the writing exercise. Thanks for taking the time to share with us. Looking forward to A Hungry Lion. Putting this book on my to-eat list. Er, make that to-read. Thanks for the great interview and writing exercise! Yes. Please try not to be hungry when reading this book. What a playful and awesome idea! Sincere congratulations on the new baby and thanks for the give away. I agree!!! Thanks for stopping by PBB! Can’t wait to sink my teeth into it! And glad to know I’m not the only one with a lap desk and/or dining room for a studio. Ha! I was thinking about you and your fancy-shmancy studio when I first read Lucy’s response. I’m looking forward to the Hungry Lion. Thank you so much for sharing your exercise ideas Lucy! Loved the interview! Can’t wait to read the book. Must order my copy before they all start disappearing! Must, must, must, must have this book! Any book that Tammi Sauer recommends must be wonderful. She has an eye and heart for making PBs sing and I know, if she loves this Lion a lot, it has to be wonderful. I love the heads up about a book with great page turns! Thank you for the posting. I look forward to this read. Can’t wait to read this one. And maybe make it to the launch. I can’t wait to read this! Thanks for a great interview, Tammi! What a great interview and that cast of characters is so sweet! Looking forward to reading it! What a fun story! Can’t wait to read it. And I loved the writing suggestion – will definitely be using that! Oh my gosh. How fun! I can’t wait to read this book! Sounds like this one is going to be joining my bookshelves soon. I love books about ani-mules. On my reading list! Inspirational how you carve out your time…lesson to all! Thanks! Thank you so much! From someone who collects images and doesn’t know what to do with them, I am know going to ask the questions- How did they arrive at this place and how will they move forward? What fun…and a great interview! Thanks for sharing! It’s on order. Can’t wait to read it. Love your idea of working back and forward from a sketch. Hmmm. What a great interview! I loved the time lapse video! Thanks so much for giving us a heads up about this book, Tammi! I can’t wait to pick it up! I had the yummy thrill of “devouring” this book after unpacking my library’s Baker & Taylor order. I would LOVE a signed copy to add to my sacred Storytime shelf (as long as all my other “treasures” don’t mysteriously disappear from the shelf)! Congratulations! I can’t wait to share at library Storytime! I can’t wait to see how she let this idea become a story! Sounds like a lot of fun. 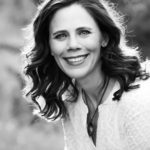 I have been dying to get her to an Oklahoma conference, knowing what an amazing wealth of knowledge and creativity she would be, and this interview proves it. Well done, Tammi, in giving us a taste of that! This looks like such a great book! I can’t wait to read it! This book makes me hungry to read it! Love the organic, informal process. Loved the time lapse video–so cool! This is my kind of story–can’t wait to read it! Congrats to you, Lucy & thanks for sharing, Tammi :). My son will LOVE this book, he’s the master of reacting to great page turns (and I might just like it quite a lot too!). Very excited to see it in the flesh 🙂 Thanks for the great time-lapse and writing exercise too. Congratulations, Lucy, on the book! It looks wonderful! And thanks for the chance to win a copy. Your book sounds like a definite read! Thank you for telling us of your process and congrats on your new reader (Nathaniel)! ” A Hungry Lion” is on my list! Thanks, Lucy, for sharing your invaluable insights. Love lions AND page turns! Wonderful article as well. Love it in every dimension, from the formal and whimsical title, to the doodl-ish art, to the wry concept. I’m going to ping the library right now and put a copy on hold. Tammi, great job on this interview, the level of detail, the time-lapse video. It’s all good stuff! This sounds like a book you can really sink your teeth into. I’m looking forward to reading it. Thanks, Lucy! Delightful tour of the creative process. I especially relate to the first effort having energy the revised version doesn’t. Sometime that’s just the way it is. You’ve completely blown all of my “why I’m not writing” excuses (justifications, really) out of the water. Slinking back to my desk now. I can’t wait to read the book and find out what happens! I love that someone had to suggest to Lucy that she create this book herself. 🙂 Congratulations, Lucy, and thanks for sharing, Tammi. Can’t wait to check it out–it looks super tasty indeed! It really is a masterful example of making the most of the page turn. This is a terrific post. I can’t wait to read this adorable book. I’m already laughing at the line-up of characters. Congratulations! On the book AND Nathaniel! This book has SO MANY great qualities, that lineup being one of them. This looks amazing! I can’t wait to read it with my kids. Lucy, This sounds like a fun book, definitely going on the to-read pile. And I loved the time lapse video, so cool! Thanks, Tammi, for sharing! Thanks for visiting PBB, Jennifer! Looks like a delightful treat! Looking forward to reading A HUNGRY LION! This story sounds grrrrrrreat, but I especially love the loose style of the art. I know what you mean about the first sketch sometimes being the best. The list of animal friends is very interesting. Thanks for the opportunity to win a copy. I love the l-o-n-g sentence that mentions the 15 animals. That sure got my attention! I know! Lucy really knows how to break the rules in great and unexpected ways. Fun interview! Thanks for sharing. I want to read this book. Such a long list, but somebody has to win that delicious book. Yes! Thanks for stopping by PBB, Sharon. This book looks thoroughly scrumptious! And I love the prompt to focus on a picture & then think what came before/what comes after. Congratulations on your book birthday & all of the starred reviews. This post and interview has piqued my interest! I’ll be looking for this one! I forget how I heard about this book but when Tara Lazar posted the link to this post/giveaway I couldn’t click it fast enough! I definitely need to find out what is happening to all those animal pals! What an interesting way this book came about. Thanks for sharing. This has been on my “to read” list since i heard about it awhile ago. I’m looking forward to reading it now that it’s been released! Congrats to you!! Can’t wait to read your book! Thanks Tammi for the brilliant post. And Lucy I cannot wait for your book’s debut!! I adore subversive books and your illustrations are divine. Super congrats and thanks for letting us peak in at your process. Can’t wait to read this! Thanks for the interview. I’ve been waiting for this book too and loved the short video that came around a few days ago. So winsome. Brava to Alexandra Penfold for planting that seed to do it yourself, Lucy. She’s a big smartie. Congrats! So excited to get this one! Tammi, Enjoyed hearing you speak in Miami in Jan.! Thanks for introducing us to Lucy! Can’t wait to see the book! The suspense is painful! I can’t wait to read this book! What a cute story idea. I’m glad the book is coming out soon because I can’t wait to see how it evolves. Thanks for the interview, Tammi. I lover the little exercise idea! Lucy is such a superstar. Thanks, Tammi, for the introduction to Lucy and her mouth watering book! Love the brilliant writing exercise, too. Thanks for putting this one on my radar, Tammi. Such a clever idea–can’t wait to read it! I always love learning the backstory. Can’t wait to read this book. Thanks for the writing exercise, too! So excited to read your debut, Lucy! Congrats! This book looks like so much fun! And the illustrations are so charming! Congratulations Lucy! I can’t wait to read your book! Thanks for sharing your studio world. This sounds like a fun read. Thanks for the heads-up! This book sounds like such a fun read! I think it’s getting released today … I’m going to try and find it. Thanks for sharing. This book sounds wonderful and I love the style of illustrations. Thank you for this post, Lucy. I like hearing how you collect ideas in all sorts of ways and keep them! Seems like you always have an active growing folder of ideas that start to blossom on their own. And the notion of observing and asking how did the situation arrive at what it is and what do the people (or animals or make believe creatures)need to do to move on seems so relevant to story building. Thank you and I am eager to read your new book!! What a great premise and lovely illustrations. Looking forward to solving the mystery! Thanks for sharing the writing exercise — I’ve jotted it down next to a list of potential titles for a PB I’m hoping my daughter will write with me.